Samsung's new flagship phone is thinner and more high-resolution than ever. And it comes with a new personal assistant named Bixby. If you're one of the 69.5 million people in the US who already own a Samsung phone, you might be wondering: Is the Galaxy S8 worth the upgrade? Samsung's latest flagship device, unveiled today in New York City, is the company's first smartphone launch in the post–Note7 explosion era. 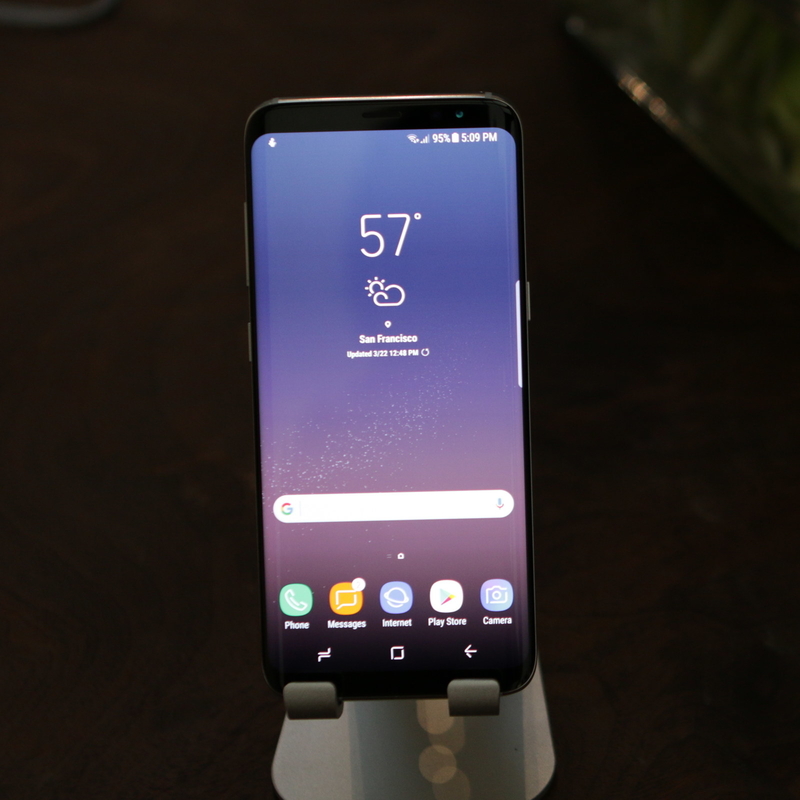 I got a preview of the phone before today's announcement, and, during that briefing, Samsung representatives reiterated their commitment to safety and the new eight-point safety protocol being implemented for the device. The Galaxy S8, which ships in April, will test its efficacy. Samsung's latest flagship phone is larger (but slimmer) than previous models and has a brilliant display with even more pixels packed in. It's an elegant device with curved edges all around, but the most noteworthy Galaxy S8 news is on the inside. "Bixby" is what Samsung calls an "intelligent user interface agent" and allows users to perform tasks with their voice. It's an interesting update, considering Google's voice-enabled AI, Google Assistant, already ships with phones running Android, the Galaxy S8's operating system. Stayed tuned for a full review, but until then, here's a look at the Galaxy S8 and S8+. There are two sizes: the Galaxy S8 and the Galaxy S8+. The smaller Galaxy S8 has 5.8-inch display, while the Galaxy S8+ has a 6.2-inch display. 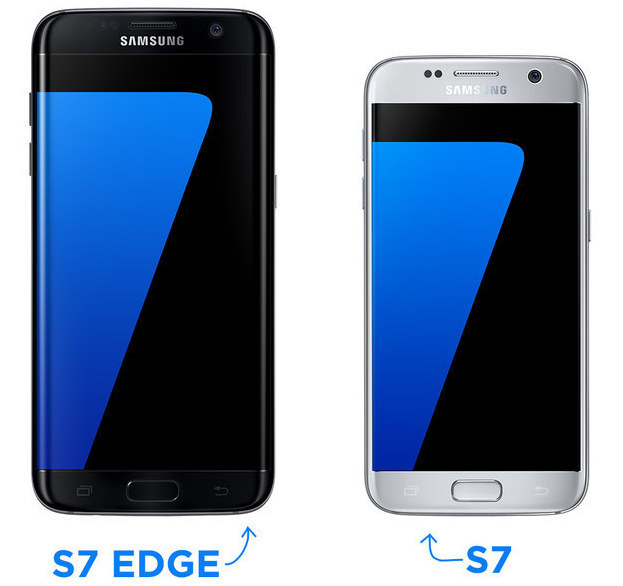 That's much larger than last year's Galaxy S7 and S7 Edge devices, which were 5.1 and 5.5 inches respectively. However, the devices' edges are curved on all four sides, which makes them seem smaller than they actually are. The S8 has a nearly bezel-less, buttonless design. Compared with the Galaxy S7, the front of the S8 has more screen and less crap surrounding it. Samsung calls it an "infinity display." The home button has also been replaced by a virtual, onscreen "button" to maximize the size of the display. It's even slimmer than the S7 – but by just 1.5 millimeters. The display's resolution features nearly half a million more pixels than the Galaxy S7 and S6. The S8's display is 2,960 x 1,440, which means that it is about 400 lines longer than the S7. However, the new S8 has slightly fewer pixels per inch (570) than last year's S7 (577). The larger S8+ has even lower pixel density (529 ppi). That's not to say that the display isn't stunning. Because of its edge-to-edge design, full-screen videos look great on it. It also incorporates the mobile HDR standard, which means that videos will appear on the Galaxy S8 the way the filmmaker intended them to. The most significant update is Bixby, an intelligent personal assistant built into the phone. Samsung is launching its own version of Alexa, Siri, and Google Assistant – and the company's calling it Bixby. The virtual assistant can allegedly do anything you can do on your phone with touch with your voice, though the Samsung rep only showed us Bixby working with Samsung default applications. 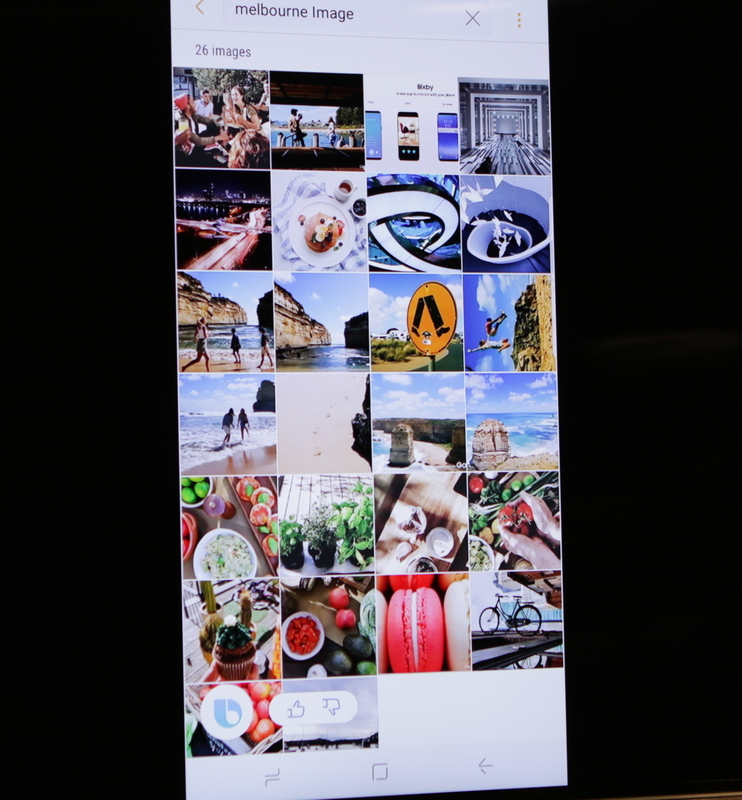 You can say things like, "Set display brightness to maximum" and more contextual requests like, "Send the last photo I took to my mom" or "Rotate this photo to the left." 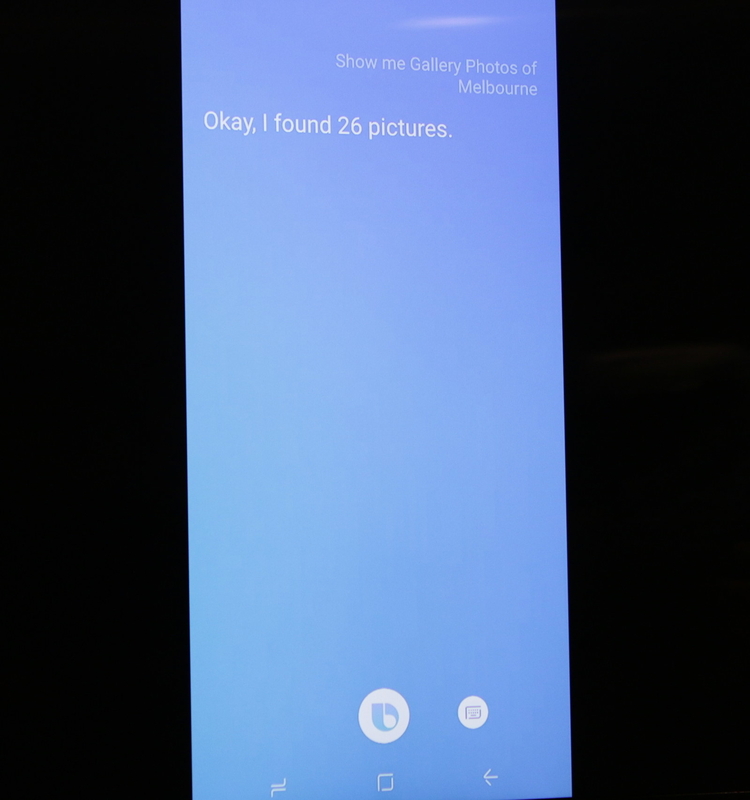 In the Gallery app alone, there are about 300 actions you can perform with touch, so because you can say something multiple ways, there are about 15,000 different voice commands that Bixby understands. Samsung is aiming to launch Bixby in 52 languages. In addition to voice commands, Bixby can "see" using the phone's camera. You can hold up a QR code, scan a business card and add the details to a contact, or point your camera at a piece of furniture and Bixby will apparently use computer vision powered by Pinterest try to find out where you can buy it. 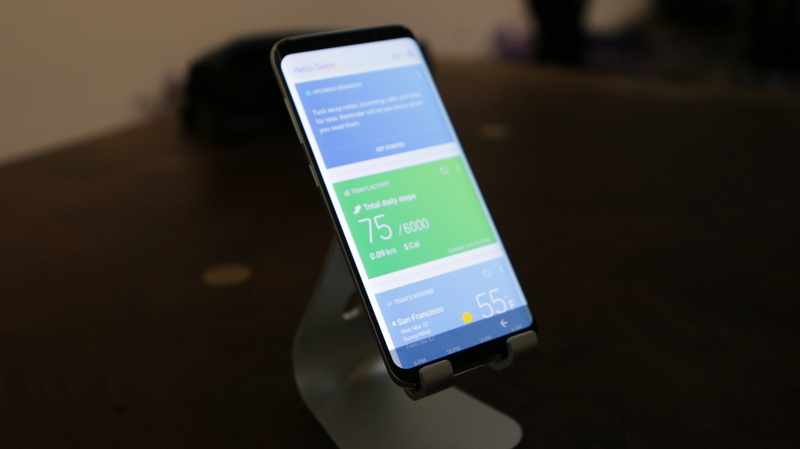 The software can do this with other items, like wine bottle labels, too, but it's not clear what it is and isn't capable of, and how exactly Bixby is sourcing its shopping information. A side button is dedicated to Bixby. Press the button to activate the assistant. 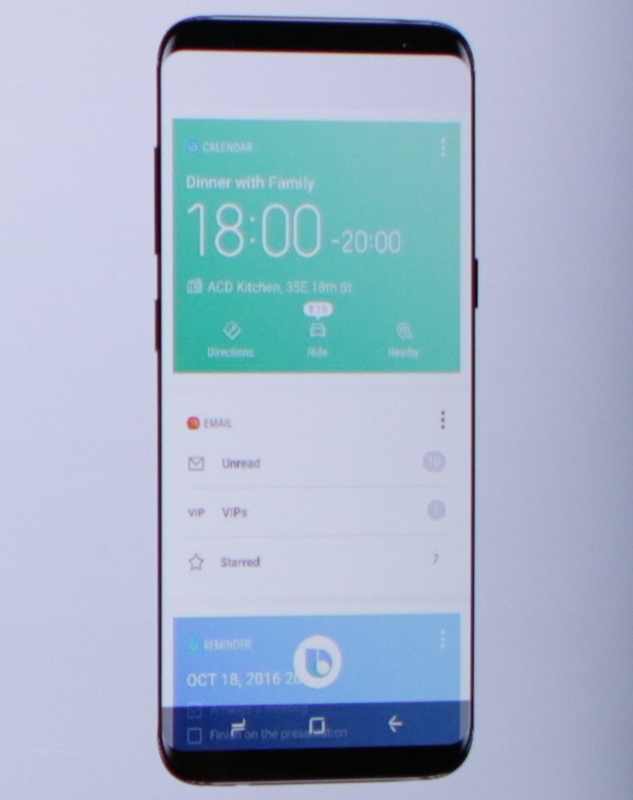 There's also a new app called Bixby Home that includes information like email notifications, events, step tracking, and weather status. It's essentially Google Now, but built exclusively for the Galaxy S8. Samsung Dex is a portable dock accessory that can essentially turn the Galaxy S8 into a computer. The hockey puck–sized dock can plug into an external monitor via HDMI and display a desktop version of the phone's Android software. It’s sold separately — and the Galaxy S8 can't connect to a computer without it. The dock basically turns the phone into an instant Chromebook. You can use a keyboard to type and a mouse to navigate. The phone is powerful enough to run two apps simultaneously. The Samsung rep was able to watch a YouTube video and type inside of a Microsoft Word document at the same time. The Dex doesn't make the phone as powerful as a full-fledged personal computer, but it does make multitasking much easier. This speaks to the power of the device's default internals. It's powered by a 10-nanometer, 64-bit octa core (one 2.3GHz quad-core and one 1.7GHz quad-core) processor designed to produce higher performance while consuming less power. If you have smart home gadgets, you can now control them with one app called Samsung Connect. Samsung products will work with the app right off the bat, and some third-party products like Philips Hue and Room are also compatible. Like previous Samsung devices, it's water and dust resistant, has expandable memory, and gives you options to unlock your phone without a passcode. The S8 has all the hallmarks of a Samsung flagship phone. It supports wireless and fast charging. The phone can withstand being submerged for up to 30 minutes in 5 feet of water. It also has an SD card slot to add extra memory for all of the photos, videos, and music you keep on your phone (it comes with 64GB). Additionally, Samsung is continuing to support fingerprint, face, and iris recognition to unlock the phone.